Almost to the date, I landed in Dakar once again. I was sad to leave Mali, and was actually a bit nervous to come to Senegal – would I remember how to get around, would it be very different? But as we flew over the peninsula, and got to see the entire city and surrounding water, I was so excited. Now that I’m here, it doesn’t feel strange, or unfamiliar. It feels like it did 10 years ago, except I don’t have to relearn everything. Plus, being in Senegal is so much easier than Mali. I didn’t even realize the apparent not-so-subtle differences. I didn’t realize how underdeveloped Bamako is, and just how developed Dakar has become. More services, more construction, infrastructure, it’s all around more modern. Bamako, while a major city, has a provincial feel, like a never-ending village. It’s not a bad thing, just my observation. I suppose that coming to this part of Africa feels normal at this point. There are certainly things that make me say, “WOW,” but I understand the daily rhythms and so it just feels like a regular place to me. We have been kindly welcomed into the home of a friend of mine I met while studying here in 2003. He and his wife have embodied the Senegalese notion of Taranga or Senegalese hospitality. They have opened their home, fed us, and toured us around the city in the last week. It has been such an amazing gift, we are often left wondering how we could ever properly say thank you. In the last week, it’s also been wonderful to do so many things I never did during my entire four months the last time. Believe or not, I never went to the beach, not even to walk, while I was here last time. 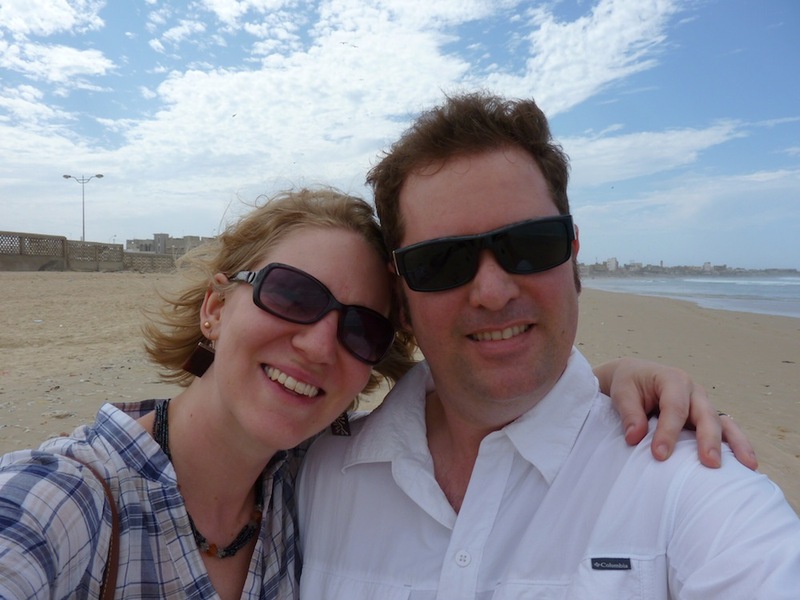 Taking strolls along the ocean, visiting the fish market and enjoying the proximity of the sea has been a lovely shift from the stark dry desert of Mali (although I really did enjoy that it only took a few minutes for my hair – and everything else – to dry in Mali). We visited my old neighborhood, SICAP Baobab, and walked the still-familiar path from the Baobab Center (where I took classes), past the boulangerie and the cabine telephone – which is now a boutique because everyone either has a cell phone or home landline, why would they ever need to go to a telephone center – past the 500 year old Grand Baobab, the namesake tree of the neighborhood, around another corner, past more familiar homes and shops and to the little soccer (sand) field, just opposite the home where I used to live. It was wonderful to walk down memory lane, and I cannot wait until Monday night when we have dinner with my host family. We’ve marveled at Dakar’s new features as well – the world’s now largest statue, made entirely out of bronze, costing the country more money than it would have taken to lift the shanty town at its base out of poverty. We strolled the sparkly new shopping mall filled with European shops – all boasting huge sales, and then played a game of cosmic bowling in the most beautiful bowling alley I’ve ever seen. Everything so shiny and new – presumably because they are too expensive for the majority of Senegalese to enjoy. Just like the huge sculpture that costs 3000cfa – more than many people’s daily wage ($6 USD) to ascend to the top, former president Abdoulaye Wade’s blatant waste of money almost mocks the Senegalese people, giving them something that links them to the western world they seem to long to be a part of, yet keeping it out of reach in a resentful way. Honestly, I feel the same way about Senegal as I did 10 years ago, and I don’t necessarily think that’s a bad thing. I recalled the email I wrote to friends and family on May 21, 2003, just a couple of days before I was leaving from my semester abroad here in 2003, and want to share it, as it continues to sum up feelings I have about being here, and what it might be like to leave again. “But what a country. I'm not sure what I'll do when greeting people doesn't include an inquisition about the family, friends, uncles, brothers and sisters. And what to do when there's no ferno at every corner with a pot of attaaya brewing. What to do when visiting friends isn't a short two minute walk down the street past the telecenter and to the right. and What to do when I can't bargain for the price I want (things are too expensive in the states anyway). I will always think of all the little children that are everywhere, who look scared, then curious, and then so excited with their big dark eyes when they see me coming. It's images of mothers with babies on the back and a bucket on the head that will always remain. It's traffic jams with 10 yellow and black taxis coming from every direction trying to go everyother direction, and no one is moving. It's carts and wheelbarrows full of mangos and oranges, next to little stands that sell peanuts and cookies for 25Fcfa. And it's the constant sound of buzzing and humming coming from the small, dimly lit 'coutures'-the tailor shops-always busy making boubous and dresses, and something for an american or two wanting to bring home a bit of Africa. I suppose the only difference there is that Youssou is now the Prime Minister and I can’t go hear him sing at his Club Thiossane for $4. The oranges now cost 75cfa (500cfa to the dollar). Oh well. Jon and I are planning to head to the Casamance on Tuesday, an overnight ferry ride (we’re still being cautious about inland travel). The Casamance is the region of Senegal below the sliver of a country, The Gambia, and is lush, green, and inhabited by the Diola people. It’s also home to tropical beaches, more fresh seafood, and a slightly different culture. I’m looking forward to seeing a new part of this fascinating little South Dakota-sized country. Until the next time, ba beneen jerejef waay (until next time, thanks!). Bisoux ciao.